Those who are considering challenging a will by making a claim for Family Provision need to be aware that time limits apply within which their application must be made. A Family Provision claim is an application made by an eligible person to the Court seeking provision (or further provision) from the estate of a deceased person. Family Provision originated in New Zealand in 1900 with the Testator’s Family Maintenance Act 1900 (NZ) and was soon adopted by each Australian State and Territory and in many other countries. 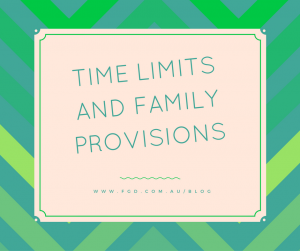 Each State and Territory has its own legislation governing Family Provision claims and therefore, each jurisdiction has different limitation periods within which a claim must be made. Some jurisdictions run the time from the date of death while others run the time from the date of the Grant. For example, in the ACT an application must be made within 6 months from the date a Grant of Probate or Letters of Administration was made. In New South Wales, this time limit is 12 months from the date of the deceased’s death. In the ACT Case of Smith v The Public Trustee of the ACT, the applicant was the daughter of the deceased and commenced her application 13 months after the limitation period had expired. The applicants excuse for the delay was that she had never been involved in legal proceedings before and her evidence was that there was an understanding between her and her siblings that any issues that arose in relation to their mother’s estate would be resolved by agreement. The applicant was a disability pensioner with very little assets. The extension of time was allowed. The case was ultimately dismissed and the applicant was ordered to pay the defendants costs. But you should not jump to the conclusion that an application brought 8 years out of time is rightly dismissed whereas an application made 13 months out of time deserves extension. In the Queensland case of Mortimer v Lusink & Ors, the applicant commenced proceedings only 9 days outside the limitation period while in Budulica v Budulic the applicant brought the application only months out of time but both of these applications for the extension of time were dismissed by the Court (one of them with costs against the applicant! ).